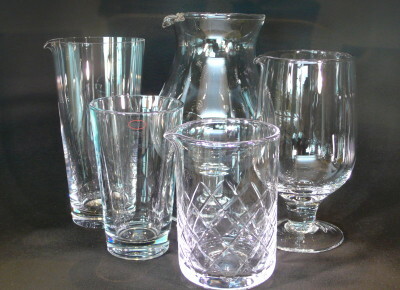 There are many types of mixing glasses. The glass of your Boston shaker works very well and is the only mixing glass you might ever need. We use it frequently, especially when muddling. A wider base allows for more efficiency when stirring a cocktail to chill it. You want to look for a thick-walled glass that is weighted at the bottom and has a pouring spout. Most mixing glasses, like the Yarai glass from Japan, have a top that will accommodate both a julep and a Hawthorne strainer.